These days I haven’t been contributing much to the events in the blogosphere, as I couldn’t prepare something specifically for these events due to the moving and stuff. Now I am settled and relaxed. So I would do more cooking for the events in the coming days (hopefully)! I made this recipe yesterday for Dhivya’s “A.W.E.D-French” event. I searched a lot for some French dessert recipes and finally landed on this simple but yummy dessert recipe. These tasted so delicious and I can definitely say that these would be a hit among kids as well as grown-ups. Peel, core and slice apples into thin crescents. Keep aside. Take milk and flour in different bowls. Meanwhile, heat the oil in a deep-bottomed pan. When the oil is hot, dip each apple slice in milk, roll in the flour and drop carefully in the hot oil. Repeat the same process with all the apple slices. Deep-fry the dipped and rolled apple slices until they turn golden brown in color. Then take them out from the oil and place on a paper towel to absorb excess oil. After all the apple slices are deep-fried, transfer them to a mixing bowl, pour the sugar on top and shake the bowl so that all the slices are coated well with the sugar. Note: You may reduce the sugar to a small amount if you don’t like too sweetness. Enjoy these yummy fried apples any time of the day. I think this will be a healthy snack for kids as it is made of a fruit. As I already told before, this is my contribution for Dhivya’s “A.W.E.D-French” event. I think this will make a nice entry for Trupti’s “Recipes for the rest of us - Picnic Eats” event too as it involves very less work. I love these and yours look super dleicious, when i make them i cut them in circles. Yummy.. Never thought of deep frying apples.. Was thinking about the taste of fried apples. I am sure it must be yummy. 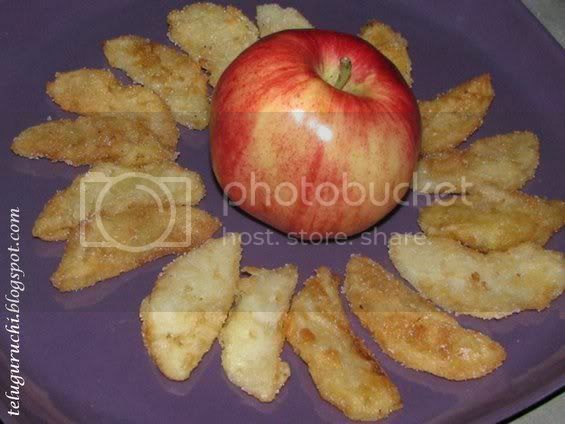 looks nice, fried apples? ?, must be nice.. Gr8 entry uma. 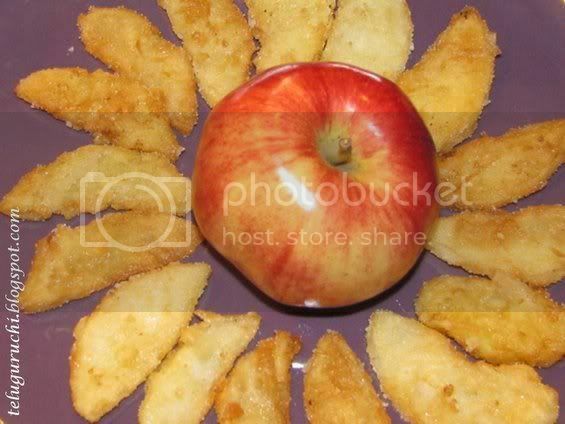 Ur blog seems changed , i couldn't recognise it first.., looks nice too..
Woww fried apples, wat an excellent snacks Uma..
i thought pommes frittes is what they call french fies in belgian - i probably am mistaken. Never tried frying fruits! Looks yummy! Oooh Uma fried apple fritters one of my favs of all time!! Your platter looks scrummy mmmmm.. Thank you very much for this lovely entry..
i want to eat some right now. delish. I read this too. Looks crispy and tasty! delicious nd new for me,..perfect for the event,..
Who says no to those goodness! Lovely and delicous! looks yumm and crispy uma..very easy to do..perfect for the events!! Wow! !This is superb..I love apples and this is such a yummy dessert :)Good one Uma. Looks crispy and delicious...wonderful dish. Never thought of frying fruits! Looks yummy! Lovely Fritters Uma...looks Yum and delicious. delicious fritters uma, never tried frying fruits. sounds different and yum. nice fritters. looks yumm..nicely presented!! Hope you've settled after the move :) The apple treats look yummy! Wow new to me. Looks ggr8. 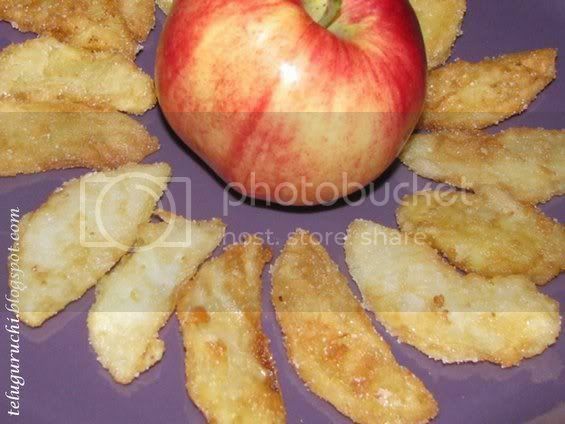 Wow, nice crispy apple fries.. yummy an simple entry !! Sure a hit !! Apple fritters chala yummyga unnayi Uma. yela unnavu? I hope everything is going good. Lovley apple Fritters, it is innovative and new to me. Thanks for your lovley comments in Jannai's blog, she is excited. Lovely fritters Uma..fried apple sounds new to me and I have never heard of it..but I guess the recipe is foolproof with just a few ingredients..great one!! wow those apple looks crispy.. I've heard of spicy fried apples, but not of a sweet version. Looks good.